Hello! Our family invites you to our Stowe resort! We’re the Nourjian family. 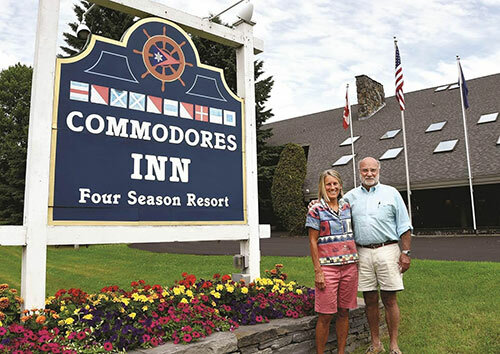 We built the Commodores Inn in 1985, and welcomed our first guests for Christmas that year. For more than 30 years – and through several additions and renovations – we’ve enjoyed meeting and greeting all kinds of visitors. Known as one of the friendliest hotels in Stowe VT, we are sincerely family-owned and owner-operated, with warm and caring staff. We look forward to the next three decades (and more!) of welcoming you and yours to our property! Bruce moved to Stowe in the 1960’s, and has been very involved with the town’s development ever since. Bruce’s community service has included Stowe Land Trust, Vermont Ski & Snowboard Museum, and Stowe Area Association. His many business endeavors include building The Matterhorn, an iconic Stowe nightclub. In 2014, Bruce was honored as the Stowe Business Person of the Year. He has 4 kids and 8 grandchildren. Originally from Massachusetts, Carrie has been an active member of the Stowe community since 1975. An avid cyclist and backcountry skier, Carrie gets outside to enjoy the mountains every day of the year! In 2014 she was honored as the ‘Toughest in Vermont’, for having the best time in the Darn Tough Ride and the Race to the Top of Vermont, back-to-back. Carrie enjoys gardening and family time with her 5 children and 7 grandchildren. What’s the greatest reward of innkeeping? Why do you love living in Stowe? I feel ever so fortunate to live in a community which is like one big family and in an area which has such an endless array of activities and events to participate in. It is so much fun to be able to share these with our guests. Bruce’s first wife, Wendy, passed away 16 years ago after a battle with cancer. Wendy was an incredible adventurer and sailor, and inspired the sailing theme at the Commodores Inn. Sailing is not the kind of theme you’d expect to find at Stowe hotels. But, the Nourjian family has spent much of their lives sailing! Bruce has sailed and raced boats all over the world. Founded in 1960 by a group of local sailors, including Bruce, the Stowe Yacht Club would race sunfish on Vermont lakes. In 1986, the skippers built remote-controlled sailboats, and started racing them on the lake at the Commodores Inn.One of the most unique things to do in Stowe VT is watch a Stowe Yacht Club race. The club races every Monday and Wednesday evening from mid-May through mid-October. Several annual regattas (including the national championships!) attract skippers from all over the country to this Stowe resort.